Rain pounded the roof most of the night to the tune of five inches. Breakfast was half a strawberry papaya with a wedge of Meyer’s lemon and homemade bread. Armed with umbrellas we headed off to Lava Tree state Park. Our first stop, though, was at Longs drugstore. Here we stocked up on local calendars, coffee, dried fish, and macadamia nuts. The Asian influence is clear with signs written in English and Japanese with Chinese fold-up takeout containers in various patterns in the gift bag/wrapping paper aisle. Lava is an interesting phenomenon; it crawls into the ocean in large ribbons and swirls and heaped up piles looking rather like a cooking experiment gone really bad. Large cracks appear with ferns sprouting up along with the ohini trees and palm coconuts. The Lava Tree park was very lush with huge vines climbing into the trees;native chickens wandered about—quite tame and quite used to visitors. A group of German bicyclists arrived and the chickens obligingly posed for them. The lava trees resemble huge mounds of lava stuck in the middle of the jungle but they all have a central core with bark patterns—the lava flowed up around the tree and made a cast of the tree. Further down the coast we saw surfers, the surf pounding the beach, a small hot pool where children were swimming about, and a few parents patiently guiding their babies in the water. What is most remarkable is the smell—there is very little—no seaweed or fish or shells on the shore. I looked for some seaglass but found only a few very small limpet shells. We had lunch at a small ocean side diner—seafood stew for Glen, a turkey sandwich for Carol and grilled ahi on sourdough for me. It was sprinkling a bit—but I managed to get some photos of papaya trees, and later on a manzana tree and fruit—plus the cast of the fruit in the hot lava. Our final stop was at the lava flow. This area is actually in private land but the state has cordoned off a pathway, parking lot, and viewing area. 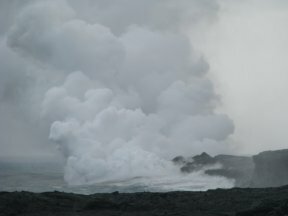 It is still active with lava flowing into the ocean with great clouds of steam. One viewer claimed she could see the molten lava but despite our best efforts and patient watching for twenty minutes or so, all we saw was a lot of steam and several tourist helicopters circling the area. We walked back, reaching the parking lot just as the official attendant arrived and informed us that we needed to read the signs very carefully and obey them—no admittance until 5:30 PM. Vendors were setting up tents in the parking lot—postcards, necklaces, and assorted Hawaiian souvenirs. I think another piece of wire came unsprung in my knee—and I was happy to head back to the house for an evening of reading and a cup of hot tea.